People have long been fascinated by interspecies relationships, and evidence of this interest is found in everything from NatGeo television shows to family movies and cartoons. 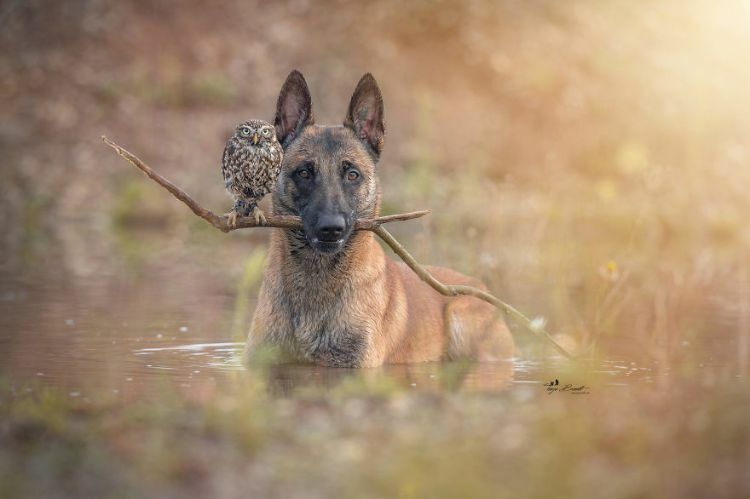 Many stories exist about different species that formed lifelong friendships, but perhaps none are as visually beautiful as the photographic record of the relationship between Ingo and his owl friend, Poldi. 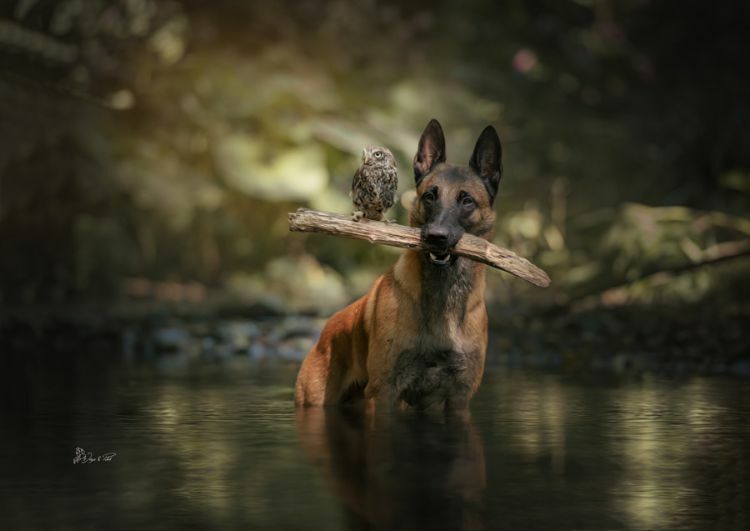 Professional animal photographer Tanja Brandt has documented the love and trust between Ingo, her Belgian Malinois, and a small owl called Poldi. 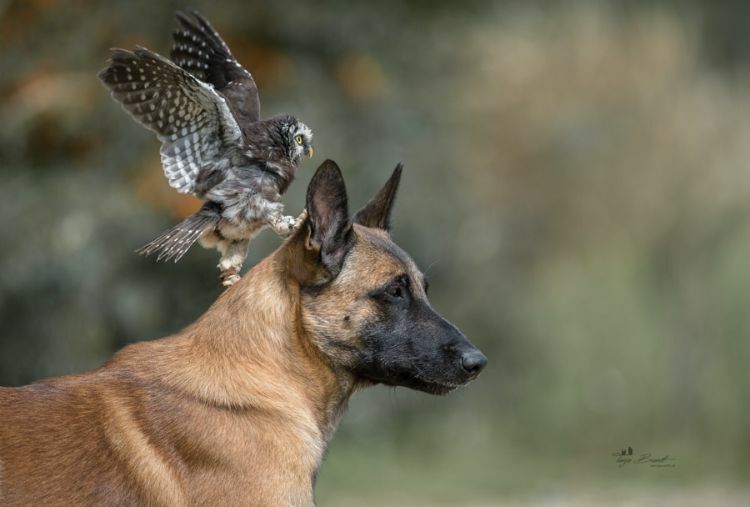 The photographs are moving, visually captivating, and best of all, capture the feelings that the dog and owl have for each other. "I love the beauty, power, loyalty, courage, and friendship of animals. Many people could learn from them," Brandt says. The love these two remarkable creatures have for each other can be seen in their eyes when they look at each other or when they accompany each other through the woods and ponds. Add the gorgeous backdrops of Germany's lush natural landscapes, and the artistic results are astonishing and moving. Interspecies bonds tend to occur more commonly between young animals. "I think the choices animals make in cross-species relationships are the same as they'd make in same-species relationships," says Marc Bekoff, professor emeritus of ecology and evolutionary biology at the University of Colorado. "Some dogs don't like every other dog. Animals are very selective about the other individuals who they let into their lives." Of particular interest is the relationship between predator and prey. These friendships happen in human-controlled environments and require an enormous amount of trust on behalf of the prey animal. 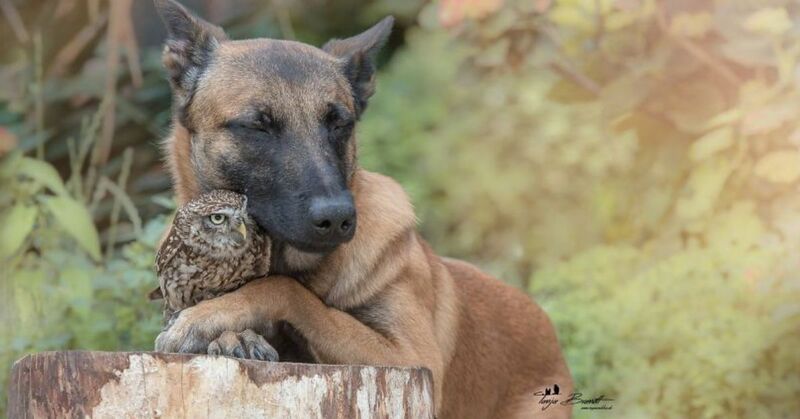 In owlet Poldi's case, this trust is placed in the right paws. 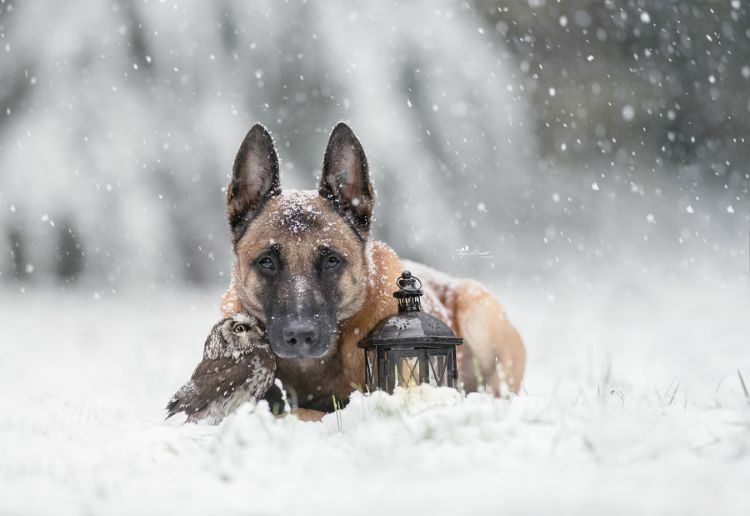 Ingo is a Belgian Malinois, a shepherd breed that is highly protective and forges unbreakable bonds with the humans – and animals – he lives with. That is one of the reasons this breed is a highly popular choice as police and military canines. Poldi, short for Napoleon, hatched two days later than his siblings, and he is much tinier than the average owl. As such, Poldi requires more care, and Ingo stepped in to provide the protection. 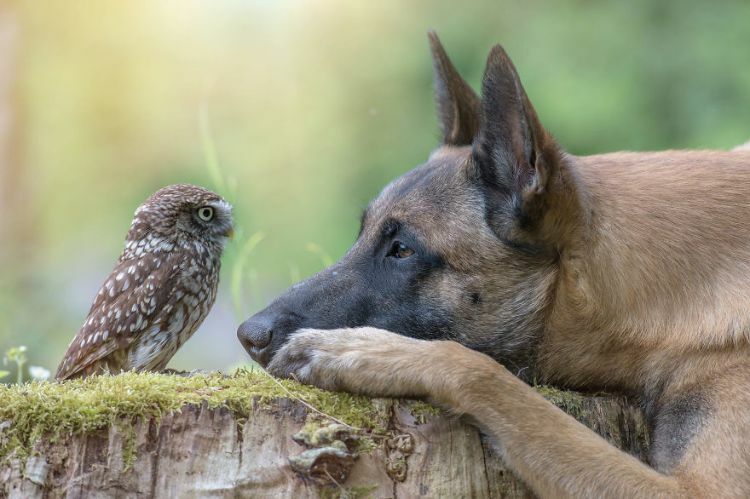 According to Brandt, Poldi “doesn’t know how to live free” and she characterizes the relationship between dog and owl as “protector-protected." “They respect each other and they can read each other,” Brandt states. However, that protector-protected line in this relationship has blurred somewhat. As Poldi has grown, he has become protective of his canine buddy as well. 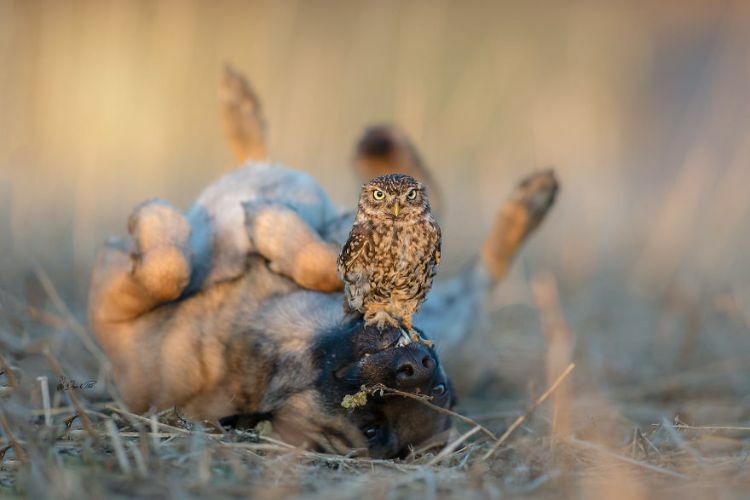 Many of Brandt's pictures show an owl who curls up against the big dog or stands on him or near him keeping watc. Poldi and Ingo have their separate lives, but the two meet and interact frequently. Brandt always has her camera nearby to preserve these beautiful moments. Many of Brandt's pictures feature Ingo and Poldi in the dark green forests and woods of her native Germany. 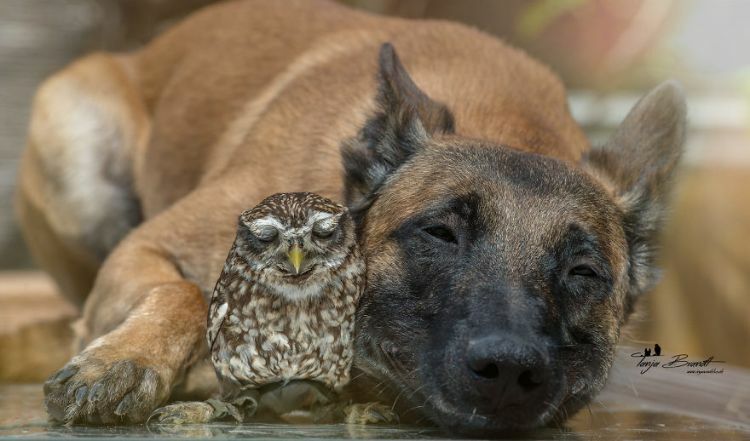 Both animals seem entirely at peace and in their right place in these scenes. There are also lovely winter pictures with Ingo and Poldi embracing the colder weather with snowflakes drifting down around them. 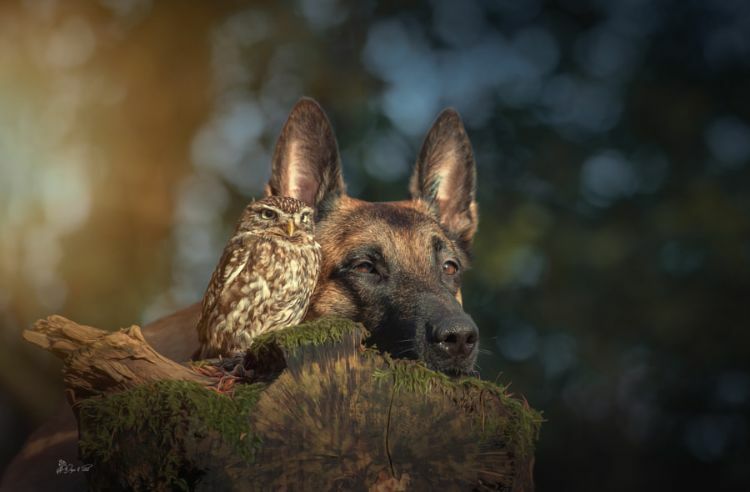 Brandt photographs many other wild animals near her home, but Ingo and Poldi have a special fan base, so she continues to add more pictures of them to her portfolio. 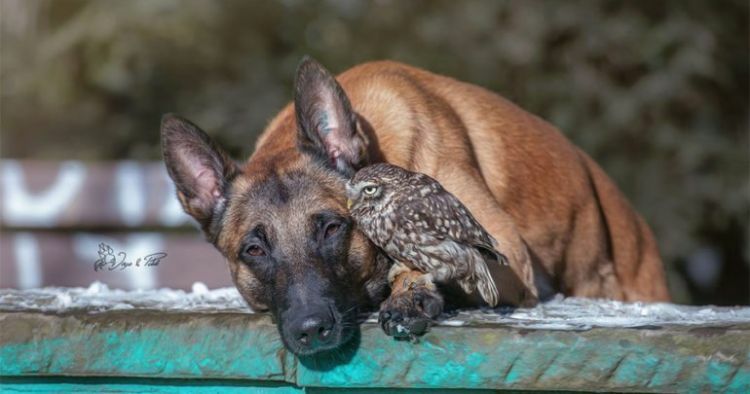 Keep up with this heartwarming friendship at Brandt's website and Instagram page, and watch the video below of Ingo and Poldi getting ready for sleep.